To be in Italy is to experience -- food, wine and art. The opera of course is an art form that originate from 16th century Florence. 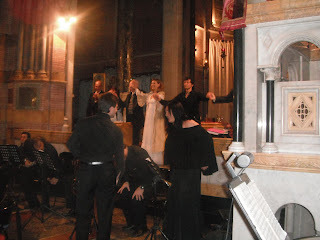 I have gone to see a production of La Traviata at All Saint's Church close to the Spanish Steps. La Traviata (Fallen One) has been the inspiration for the Hollywood movies, Moulin Rouge (with Nicole Kidman) and Pretty Woman. This production being in a church, is very intimate,unlike being in an opera house. It still is very professionally done, though. Some people were dressed up, but most were very casual. The best thing about it is that it only cost 20 euro. Subscribe To Where is Liza? Where Is Liza? ©. Simple theme. Powered by Blogger.